I have worked with several teams to define goals (career, personal, annual, etc.). 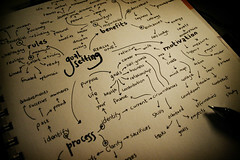 After we establish goals, we then move to the HOW phase of goal attainment. We’ve established together WHAT we want to accomplish, and now it is time to define the HOW. Goals do not just happen. Goals are the vision of the end of a particular journey. The HOW is the roadmap we create to get there. Too often, we establish goals that seem beyond our reach (Ever heard of a stretch goal?). There is always a lot of buzz at the beginning of a new year about goals and resolutions. Ask any faithful gym member, and they’ll tell you that January is impossible at the gym. February is a little better, and March resumes some sense of normalcy for regular gym-goers. Goals without well considered HOWs are little more than wishes. Our goals need to be written down (More appropriately typed into Evernote these days), and the HOWs need to be recorded just under them. HOWs need details like frequency, timetables, and an attainable roadmap to completion. Goals need support, and one of your HOWs needs to be enlisting the help of an accountability partner. Someone beyond me needs to be aware of the goal I have set and be interested enough to hold me accountable to my goal. Goals are important, because they give us a sense of accomplishment. They allow us to make more of ourselves than we were before we reached (or exceeded) them. Spell out in painstaking detail precisely HOW you plan to achieve your goal, and you will realize that the goals you establish are little more than well-considered plans. Isn’t that what a goal should be anyway? So, do it today. Establish goals for yourself and start building your HOWs. Once you have your HOWs in place, start with taking the first HOW and putting it into practice. Whether it is starting a new business, writing a book, losing weight, or being faithful to healthier eating, you can set goals for yourself, define your HOWs, and start to make positive change immediately. Perhaps you have already established goals and have not yet defined your HOWs? What are the HOWs of the goals you’ve set for yourself?